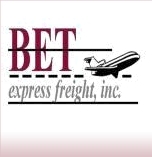 BET Express is a woman-owned small business specializing in Freight Forwarding and Logistic Services, providing customer service driven air and ground transportation within the United States and Canada. By providing accurate timely communication, flexibility, cost effective solutions and on time quality service, we have earned the trust and loyalty of our customers. Over the years we have literally adapted our business to meet and exceed the transportation and logistics needs of our customers enabling us to build long lasting relationships. We are available and at your service 24 hours a day, 7 days a week. We can even make pick up’s or deliveries on weekends and holidays. 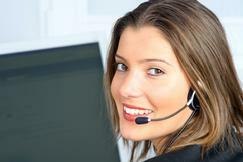 Unlike many transportation companies that use automated or voicemail services, when you call BET Express you will talk to a live person who is ready to help you at any hour. BET Express provides a complete Ground Transportation Network with hundreds of daily line hauls to and from every city in the U.S. and Canada. 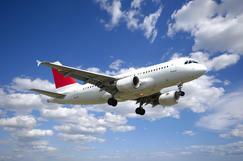 Air Ride trucks and time definite schedules make moving sensitive and timely shipments our specialty. BET Express has developed partnerships with all of the major airlines which allows us to utilize thousands of passenger and cargo aircraft at any time, anywhere. With the availability of any airline at any airport on any flight to transport our customers valuable cargo, we are much more flexible than many other carriers. 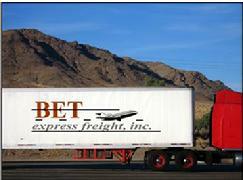 Copyright � BET Express Freight, Inc.